An excellent solution for your training or conference room needs. Only Available with Black Base. Dual-sided levers for a quick-flip of the top. Tables nest for compact storage. Integrated Modesty Panel with built-in cable trough. Tables are shipped in two boxes, top and base separately. 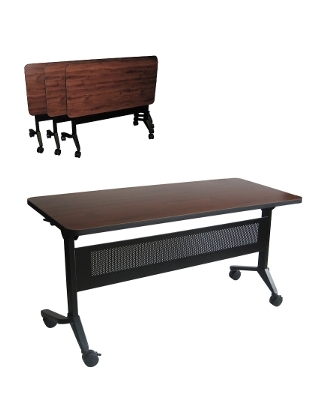 Overall HPL table height: 29". 5 1/4" between tables when nested. 150 lb. weight capacity, evenly distributed. Quantities of 5 or more may cause lead time to increase.